Does Kylie Jenner have something to hide? 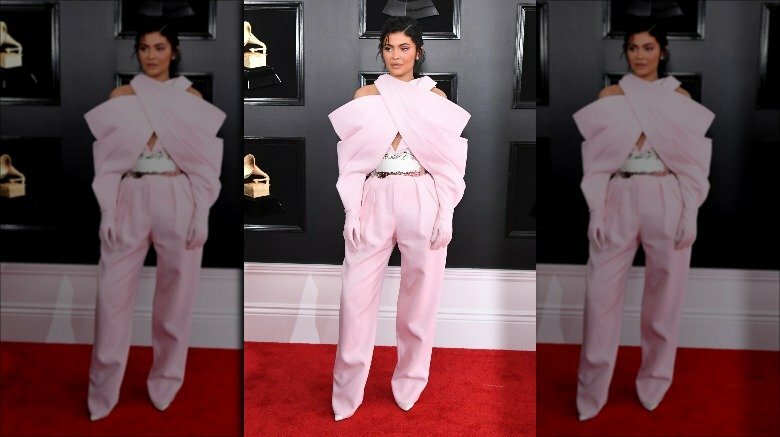 On Sunday, Feb. 10, 2019, reality TV star and beauty mogul Kylie Jenner attended the 61st Annual Grammy Awards with her boyfriend, rapper Travis Scott. While walking the red carpet ahead of the big show, Jenner showed off her look of the night — what appeared to be a pink jumpsuit with a "straight-jacket-inspired" top designed by Balmain, as reported by StyleCaster. And, as part of her ensemble, Jenner's hands were totally covered, as the jacket she wore boasted attached gloves, according to Harper's Bazaar. So, just why is this newsworthy? Well, there have been rumors that Jenner, 21, and Scott, 26, who share 1-year-old daughter Stormi, may be engaged. And, with her hands — or rather, more specifically, her ring finger — covered by a glove, it's impossible to know if Jenner could be hiding a sparkly diamond engagement ring underneath. You see, Jenner posted a photo of herself on Instagram on Jan. 5, showing off a ring on that finger. "I see that ring boo," one social media user wrote in the comments at the time, as reported by E! News. "Engagement ring?" another commenter asked. Later that month, Jenner captioned another picture of herself with, "Extraño a mi esposo," or "I miss my husband." But whether she meant that Scott was literally her husband or if she just said it as a pet name for her boyfriend remains to be seen. With Jenner remaining mum about the ring, her fans speculated that Scott might propose to his lady love while performing at the Super Bowl on Feb. 3, as he'd previously told Rolling Stone that he wanted to propose to Jenner "in a fire way." But the Super Bowl halftime show came and went without any epic proposals, so fans assumed that Scott had yet to pop the question (via Cosmopolitan). But then, what do you know, Jenner was spotted with a big ol' ring on Scott's Instagram Story the next day, as reported by Cosmopolitan. And then on Feb. 10, before the 2019 Grammys, Jenner shared a series of photos on her Instagram account, showing off pictures from Stormi's epic amusement park-themed birthday party. In one photo, Jenner holds baby Stormi while posing in a decorative hot air balloon with Scott, and, if fans look closely — very closely — they can see that Jenner is sporting a ring. The ring can also be spotted in another photo featuring Jenner holding Stormi's hand near a ball pit. So, is Jenner engaged to Scott or what? Well, according to two of Jenner's sisters, she is not yet engaged. During an appearance on The Ellen DeGeneres Show on Feb. 8, Kendall Jenner told host Ellen DeGeneres that she didn't think her younger sister was engaged to marry Scott. "Not that I know of," she replied when asked if there was a proposal. "Not that I'm aware of. But if he did, she hasn't told the family yet. I don't think that that has happened." Similarly, Kim Kardashian shared with late night host Jimmy Fallon that she didn't believe Jenner had gotten engaged yet. "She's pretty secretive, but I'm sure she would have told me," Kardashian said during an interview on The Tonight Show. "I'm not really sure. But I don't think so." But while we'd like to believe what the Kardashian-Jenners have to say about one of their own, we just don't know if we can given their track record. After all, they remained silent about Jenner's pregnancy up until the lip kit businesswoman announced she'd had her baby. So, clearly, these ladies know how to keep a secret. 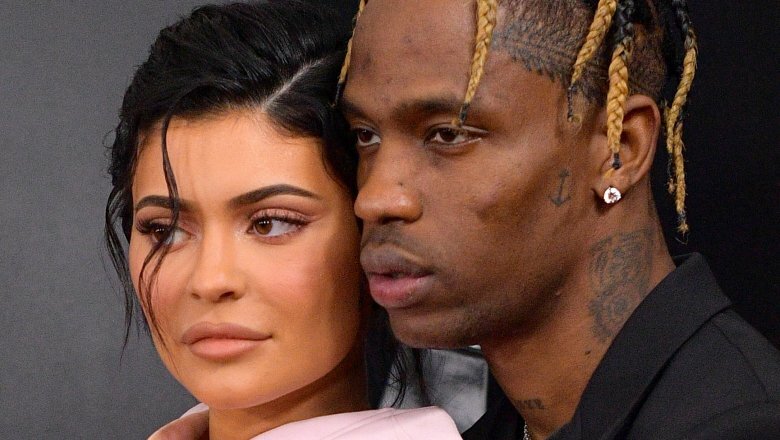 If Kylie Jenner and Travis Scott aren't engaged yet, they likely will be in the near future. Back in January 2019, a source told People that the two celebs "are looking to get married soon." The insider added that Jenner had wanted to take things with Scott slowly, "after seeing her sisters' past relationships fail." Not a bad idea. Still, while we don't know for sure if Jenner has any concrete plans to marry Scott yet, we can't help but imagine just how lavish their potential future wedding ceremony might be. After all, Jenner clearly spared no expense for Stormi's birthday party, which featured rides, a "Baby Shark" performance, and even merch (via Cheat Sheet). So, we expect Jenner and Scott to pull out all the stops for their future nuptials.